After receiving the news that a loved one has died, take a few moments to send condolences to the family. If the deceased person was a close family member or friend, a quick phone call expressing your sympathy is OK to do. Express to the surviving family members how sorry you are for their loss and offer your assistance in planning the funeral or memorial service. If you do plan to visit in person, make sure you don't stay for very long -- maybe 15 minutes at most -- long enough to express your sympathy. Sending a sympathy card or note. Sending a small sympathy gift or flower arrangement to surviving family member's home. Preparing a few oven-ready dinners. Offering to care for any children or pets in the home. Offering to help clean the home or tend to any shopping or gardening that may need to be done. 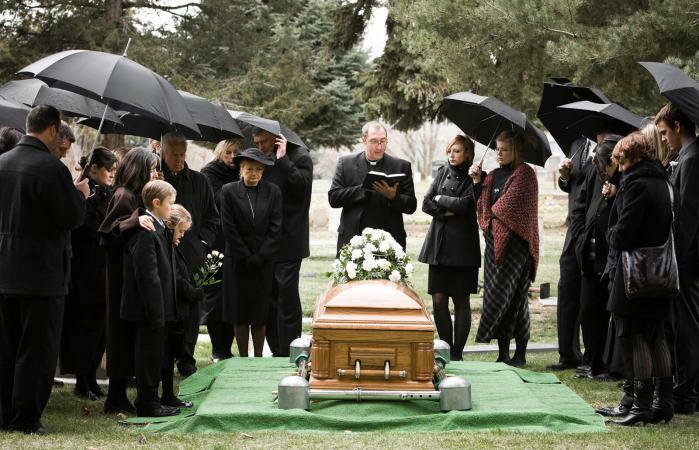 Attending a wake, funeral or burial is never easy to do. There are many things to take into consideration before you go. Unless the deceased person was an immediate family member or extremely close friend, young children, mainly babies, and toddlers, should not attend as it is very hard for them to be quiet and be kept busy during the service or wake. Older children should be encouraged to attend as it is important for them to understand death and what funeral etiquette is expected. 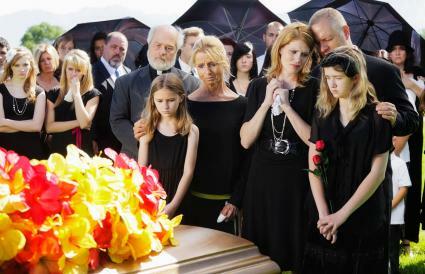 It is ultimately up to the parents to decide if their children should attend a funeral or not. However, if you decide to bring a child to a service, be sure to leave the room if he or she becomes loud or disruptive. The sunglasses should be a classic style with no embellishments. The plainer the better. Sunglasses are completely appropriate for outdoor funerals. It is totally acceptable for a man to wear sunglasses to a funeral as well. Since eyes are teary, swollen and red, people will understand if you leave your sunglasses on indoors. If possible, remove your sunglasses when having a conversation with someone. Eye contact is so important when communicating. If it is dark inside the church or becomes dark outside, it may be best to remove your sunglasses so you don't trip or fall. Funeral etiquette includes where people sit at the wake, funeral, or burial. For the most part, any seat is acceptable, except for the first few rows of pews or chairs, which are usually reserved for immediate family members. If you aren't sure of the proper seating arrangement, contact the funeral director for information. In cases such as this, simple is usually best. Simple flower arrangements or plants are OK to give or be sent to the funeral home. Many times, families will request monetary donations to a favorite charity in lieu of flowers or other sympathy gifts. It would not be proper funeral etiquette if you go against these wishes. Depending on the culture and religion of the deceased person and his or her family, most funerals end with a customary breakfast or lunch at either a restaurant, hall/lodge or the family's home. It is proper funeral etiquette to attend this gathering; however, pay close attention to the clock and don't overstay your welcome. This gathering is usually more light-hearted and casual, and in most instances, children of all ages are welcome. Checking in with the family periodically to see how things are going. Sending a card or short note expressing your concern for how they are doing. Mentioning the deceased person's name when visiting with the family. Establishing a memorial in the deceased person's name. Remembering the family during the holidays, anniversaries and birthdays. These pointers about funeral etiquette are just guidelines as to what is acceptable. Each funeral is different, so the standards may be altered as well. If you aren't sure as to what funeral etiquette is recommended, check with the funeral director or those associated with planning the funeral.